Downtown Disney is getting ready to host an event more important than the Super Bowl, and the Academy Awards combined. It’s time once again for – drum roll, please – the Festival of the Masters. Okay, okay. I admit it’s not as grand as I want it to be. There won’t be any long-winded speeches from the Hollywood elite, and the chance of Andrew Luck leading his team to a forth-quarter win is about 0%. But there is art. Disney art. Plenty of it. As a gent who enjoys painting, drawing, and doodling, I’m pretty excited. Award winning artists from across the nation will have their works (and themselves) on display in tents around Downtown Disney beginning this weekend. Art of Disney is one of the most unique, and magical stores in the whole of Walt Disney World. The original works inside have, many times, served as inspiration for my own paintings. Plenty of the paintings hanging at Art of Disney are on my ever-growing wish list of things-I-need-to-buy. Alas, I rarely have a spare $2, 500 burning a whole in my pocket to purchase one. Any true Disney fan should enjoy Festival of the Masters, an under-rated and almost forgotten Disney tradition. So often, Disney guests are fast to dismiss Downtown Disney for the speed of the parks. Festival of the Masters marks a perfect chance to slow down and take in the details. The Walt Disney Company was founded on the shoulders of talented artists like Frank Thomas, Les Clark, and Ward Kimball. Take a moment to lay down the Fast Passes, my friends. Ignore the clichéd family photo in front of the newly installed over-sized Christmas décor (at least for the afternoon). Instead, hop the bus to Downtown Disney, grab some Fish and Chips from Cooks of Dublin, and check out the pieces on display from some of the most talented artists working today. On Monday, Disney Cruise Lines announced some new and altered itineraries for some late 2013 sailings out of Galveston. This Texas port is still young for DCL and it would seem they are still trying to find their sea legs with clients who would sail from this location. The new itineraries include Caribbean 7-day sailings with stops at Disney's standby Grand Cayman and Cozumel but also adds Jamaica -- a brand new port for DCL. The new Bahamas 7-Day includes Key west and Nassau, but also Castaway Cay, a port that was glaringly absent from Galveston sailings up until now. They also announced a 6-night holiday cruise with only two ports of call and three days at sea and two four-night "getaway" sailings just after Christmas and over New Year's 2014. Any guests who are currently booked to sail during this time will be contacted by their travel professional with options for rebooking or cancellation. Personally, I am surprised to see Jamaica as a Disney port considering the issues there over the last two years. Although many cruise lines still offer Jamaican ports with no issues, the family market is not highly tolerant of areas of any risk at all. That said, it's exciting to be able to offer a new destination from Disney. The best news, however, is the addition of Castaway Cay to the itinerary for the Bahamian cruises. Disney's private island is a high point on any Disney cruise and is extremely popular with guests. Although many major cruise lines offer a private island or beach on their Bahamian and Caribbean itineraries, few can compare with Disney's beautiful island and especially with their ability to dock the ship and not have to tender passengers in. This is fantastic news for Galveston guests and the future of DCL in Texas. The Osbourne Family Spectacle of Dancing Lights has been one of the most popular holiday attractions at Disney World since its first run in 1995. At nearly 20 years old, you would think that attendance and fascination with these magical lights would have waned somewhat. Oh no! Each year Disney 'pluses' the attraction with something new and special for that season...giving guests yet another reason to come down for this special event. This year is no exception by any means! Perennial favorite, Goofy, will be available for a meet and greet dressed up like santa claus! Not only does Goofy's costume look fabulous, he will (apparently) be greeting guests in front of a wonderfully festooned Christmas backdrop, and bringing with him a version of "Winter Wonderland" to the menagerie of classic Christmas songs. I'm really looking forward to another reason to spend time among the glittering lights! Well, it’s that time of year again. The pumpkins and the not so scary costumes have been stored away for another year, and Disney turns to the next major holiday at the Walt Disney World Resort, Christmas. The usual suspects are in play this year. 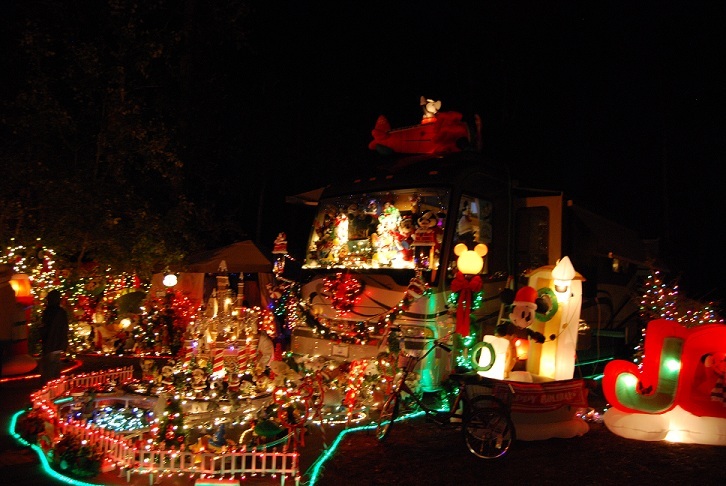 All of the resorts are decorated from top to bottom with trees, wreaths, bows and gingerbread structures. The special parade floats are cleaned and ready to go. Special pyrotechnics are added to the fireworks shows and the Castle Dreamlights are plugged in, and have transformed Cinderella Castle into a beautiful ice palace. The Christmas Season will be in full force beginning with the sold out Mickey’s Very Merry Christmas Party on November 9th. My personal favorite Christmas event at The World also kicks off on the 9th, The Osborne Family Spectacle of Dancing Lights at Disney’s Hollywood Studios. Sure it will probably be in the 80’s and people will be in shorts, but back on the Streets of America, you can’t help but feel like you’re in an Irving Berlin Christmas song. This year, Disney is adding some new touches to the show which should make it extra special. 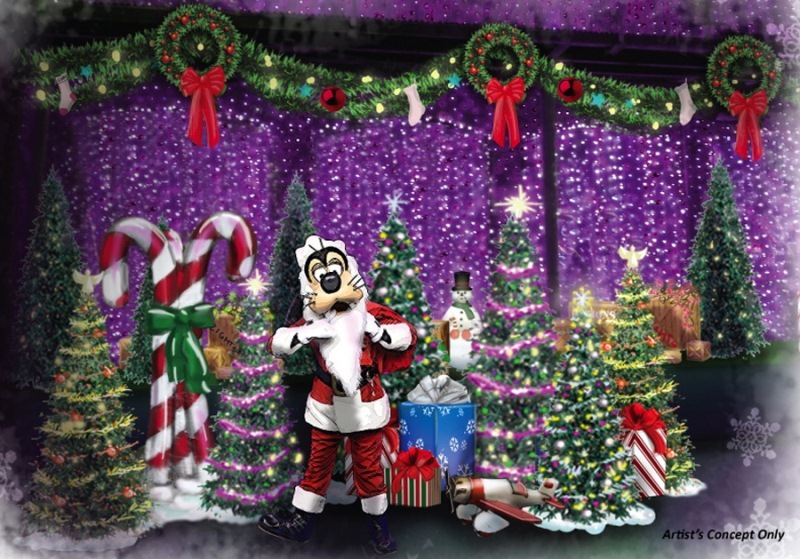 Santa Goofy will be making appearances in the new Goofy’s Winter Wonderland area which should provide a great opportunity to meet one of The Big Four all dressed up for Christmas. In addition, a new arrangement of Winter Wonderland has been added to the show. This will give those dancing lights something new to dance to. The Osborne Lights are already a huge draw at Christmas time and I think these new additions will improve the event and will entice even more people to head to the Studios to experience this Disney Christmas tradition. Wreck-it Ralph opened in the US last week, and has already topped the Box Office with takings of $49.1m. That's quite a few gold coins for a film based on video game characters. As I live in the UK, we have to wait until February to see this movie, but with the Box Office doing so well in the first week in the States (and the critical response being mostly positive), rumours of a sequel are rife. As I haven't seen the movie, I can't comment on whether it should warrant a sequel, but this adds on to the fact that Hollywood seems to have no concept for original or unique ideas. Of course, it is possibly too soon to decide if a sequel should happen, but from articles and interviews online, it seems inevitable. My opinion? Well, if the sequel can bring the heart and story that other franchises have done (such as Toy Story, for example), then I am all for it. When I enjoy a film – and specifically the characters – I just want to gobble up as much of that world as possible! So I can see why a film which does well has the automatic sequel tag added to it, but it doesn’t mean that everything that has been successful should have follow-up movies made. I loved Finding Nemo, but am hesitant at any sequels made from that smash hit. That being said, if there is a market, in terms of movies, merchandise and spin-off opportunities, the sequels will keep churning out (Cars 2, anyone?). At least nowadays the focus at the Walt Disney Company is appears to be more on storytelling and the strength of that aspect. It gives me hope that if a sequel does happen, it will be as good as the original. Christmas is already in (almost) full swing at Walt Disney World! The Castle Dream Lights began sparkling the night on Tuesday, and this Friday a sorcerer’s hat full of more magic will launch: Mickey’s Very Merry Christmas Party at the Magic Kingdom, the Osborne Family Spectacle of Dancing Lights at Hollywood Studios, and Mickey’s Jingle Jungle Parade at Animal Kingdom. Epcot’s festivities, including Holidays Around the World and the Candlelight Processional, won’t start until November 23, the day after Thanksgiving. And if you’re not headed to MVMCP, there are still a few great options to meet the characters in holiday attire. Santa Goofy will be near the Osborne Lights at the Studios, while Mickey and friends will be decked out for the season in Camp Minnie-Mickey at Animal Kingdom (all starting Friday). Of the 21 films submitted for consideration in the Animated Feature Film category of the 85th Academy Awards, four of them are Disney films: Brave, Frankenweenie, Wreck-It Ralph and Secret of the Wings. With competition like Hotel Transylvania and Madagascar 3, I'll be totally shocked if either Ralph or Merida doesn't take home the little Oscar statuette. But the real question is: will any of them be considered for Best Picture? Be sure to check out the official nominations, which will be announced on January 10 at 8:30 a.m. (Eastern Standard Time). I like that the powers that be behind Sorcerers of the Magic Kingdom aren't sitting on their laurels with their new collectible game. The release pattern of the cards, with the Super Rares just recently being unveiled for purchase in the park, and specialty event cards, shows that they know they've got a hit on their hands. At the same time, they're not flooding to market with cards and sets that would be unobtainable to guests who do not frequent the parks on a regular basis. I'm enjoying the ability to collect, slowly but surely, as I get over to the Magic Kingdom, and not having to worry about a new set creating panic for me to collect the original set in a relatively short time. The special event cards is giving something back to those who attend the parties each year. For the past several years, many regular guests had felt that they had been asked to pay more, but get less, for the Halloween and Christmas parties. While the Sorcerers of the Magic Kingdom cards are not the solution in and of themselves, they are certainly a step in the right direction. 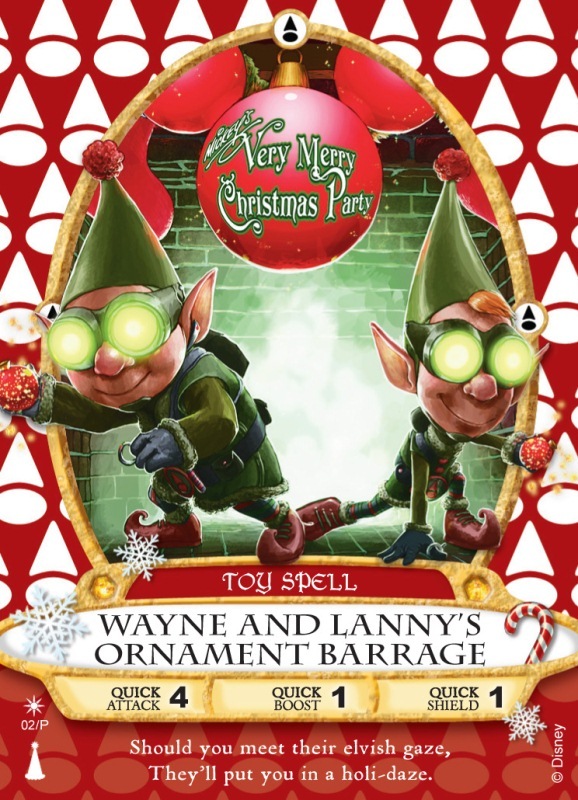 Oh, and if you happen to have an extra Chip 'N' Dale's Bag of Tricks, or grab a duplicate of Wayne and Lanny's Ornament Barrage, think of this newspaperman and send them my way, would ya? Do you miss the Boy Meets World reruns that used to play on the Disney Channel at 2am? Do you leave for work late each morning every morning because Boy Meets World is on at 7 a.m. on ABC Family? If you answered yes to either of these questions (with exclamations points, like me!! ), it’s possible you may keel over with excitement about a project that is making waves all over the internet. The Disney Channel is in the early stages of casting and planning a Boy Meets World sequel with a twist: the focal point of the show would be Cory and Topanga’s teenager daughter, Riley. Okay sure, this could spell potential disaster but with the news that Ben Savage and Danielle Fishel are in talks to take part and that original executive producer Michael Jacobs is penning the pilot, I’m feeling very hopeful. In fact, I think this is a great move for the Disney Channel in general. Since Raven, Miley, and Demi made their exits from the station,there hasn’t been much of a reason for me to tune in. But the possibility of reuniting with two dear characters and discovering their new world would win my heart back for sure. And probably the attention of many nostalgic and curious 20-30 year olds as well – way to bring in a new demographic!